Just a few words to the operation of the goggles, to get you off to a good start. Keep in mind: this is "tech talk" and even if you don't understand what's written here, you can still use the goggles following the "ready made" examples and just draw lines in the Tracktion Project, to get it to work (!) Or just follow simple instructions for example, to get the X/Y pads on TouchDAW working with the MIDI Goggles. There are 2 basic modes of operation, MONO or STEREO. The mode is selected via the channel selection (1-16). When sending MIDI messages on channel (6,7,8) the unit switches automatically to MONO mode. When sending MIDI messages on channel (9 - 14) the unit switches to STEREO mode. In STEREO mode, the left eye piece can be controlled independently from the right eye piece (except for the pulse frequency !). Most parameters can be controlled via "pitchbend" messages, by making use of the 16 available midi channels. 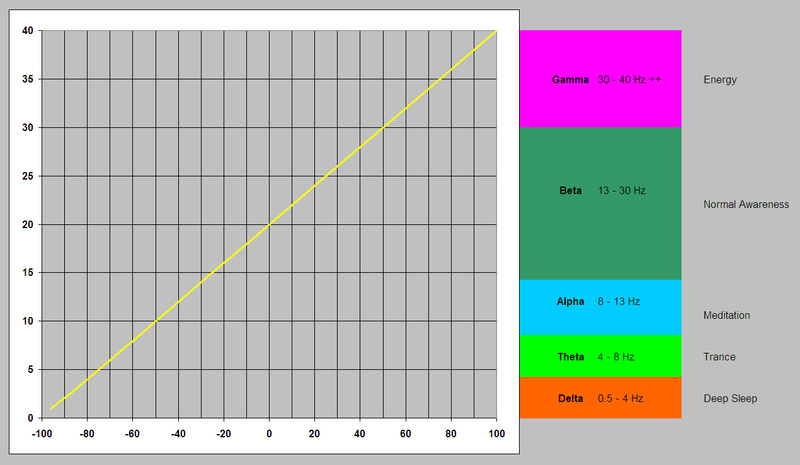 Colour and Frequency are using 14 bit control values (0-16383). All other parameters are only 7 bit values (0-127). Most parameters can also be controlled via "note ON" messages and CC messages (Continous Controller messages) both of which are only 7 bit control values (0-127). Note: When controlling Colour or Frequency (0-16383) via the Keyboard "note ON" message, the note-value (pitch) is multiplied by 127 to get the desired control range and then, the note-velocity is added to that number, to allow for increased resolution. For example to send a control value of zero, you must send a note with the pitch of zero and the velocity of zero. On the other end of the range, if you want to achieve the maximum value of 16383, you must send pitch of 127 with velocity of 127. In general, it's OK to just keep the velocity to a fixed value of say zero, or 64 (best) or just leave it at 120 ... 127, whatever, as long as you get the colours you like. There are 2 other modes of operation and they are "continous oscillation" mode (OSC mode) and "single shot" mode (AD mode). Switching between the modes is simply achieved by either "setting the frequency parameter" (sending a frequency command will activate the "continous oscillator") or by firing a "single shot oscillation" (either via KB or via CC) which will pause the "continous oscillator". When in "single shot" operation, low values/notes will trigger a "slow rise/fall" single oscillation and higher values/notes will trigger a "faster rise/fall" single oscillation. Any new trigger will "over ride the current rise/fall single oscillation. The best way to get started is to focus on the primary elements of COLOUR and FREQUENCY first. No need to worry about all the other parameters. From there on, you can start to experiment with BRIGHTNESS, PHASE, BALANCE and WAVE-FORM, if you like. All the other parameters, you can leave in their default position. 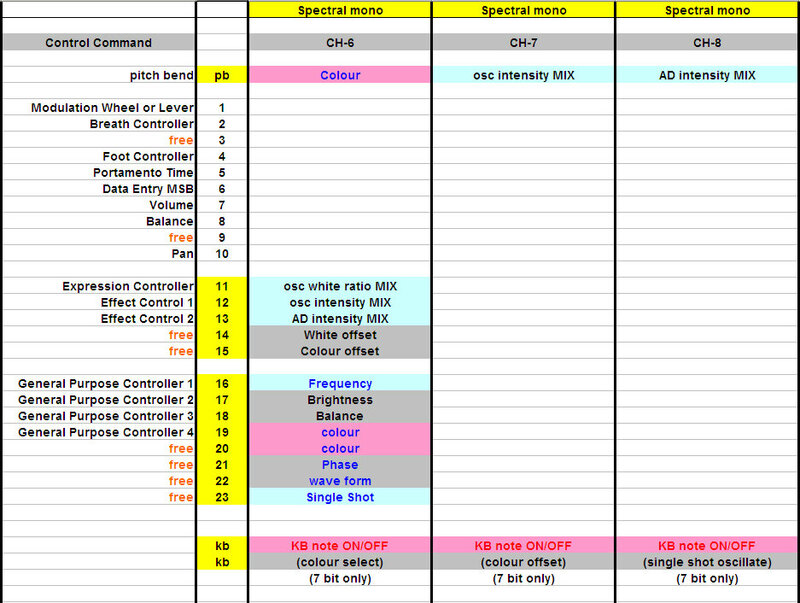 Here is the overview of all the different MIDI commands implemented. 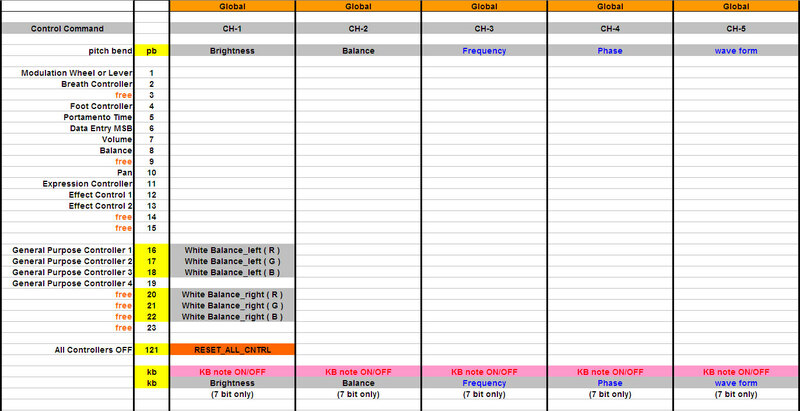 There are 3 tables, the first one contains the "global" control parameters, the second table relates to "mono" operation and the last table shows stereo operation (left/right eye piece). The CC message "121" (All Controllers OFF) when sent on midi channel 1, will reset the goggles to their default settings. To send this command as the first message at the beginnign of a Light Scape Sequences is recommended in order to "clean the slate" of any previous "changes" from some eLSD sequence before. Controls the overall brightness of the goggles, from min (0 = OFF) to max. Brightness "Balance" between left and right. 50% value is equal brightness for left/right. This controls the "continous oscillator" that pulses the goggles. From very slow to about 40 Hz. 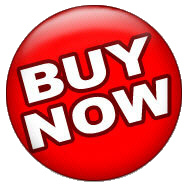 (pitch all the way up to +100% = 40 Hz; +50% = 30 Hz; 0% (middle position) = 20 Hz; -50% = 10 Hz; - 80% = 4 Hz; -96% = 1 Hz and -100% is 0 Hz) This is very important because different frequencys have different effects on your "state of mind" ! Makes one eye piece lag relative to the other eye pice. Goes from 0 degree to 360 degree (control value of 0 ... 127) where middle position is maximum "lag" between the two. Best to try out and see for yourself. This one will allow you to change waveforms of the oscillator: a value of zero results in a "triangular" wave form. Increasing the value to 1 changes that wave into a sinus (softer) wave form. With increasing value, the sinus wave turns more and more into a square wave (hard ON/OFF). 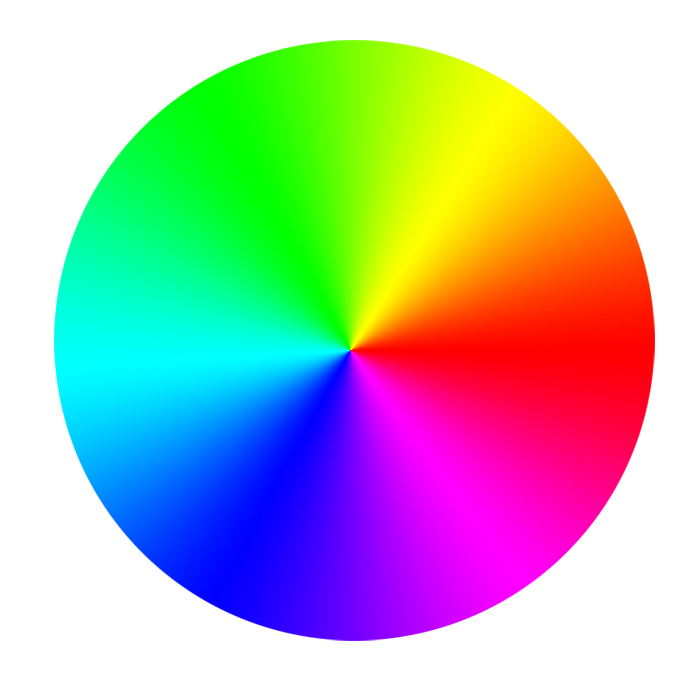 This value controls the "colour wheel" (!) The colour wheel has 6 sectors. It starts with RED (pitchbend at minimum -100%) and it finishes at RED again, with pitchbend at maximum of + 100 %. As you move through the colour wheel from min to max, the colour goes from RED to orange to yellow to GREEN to blue and more BLUE to purple to RED again ! AD stands for "Attack/Decay" or rise/fall. Low values/notes will trigger a "slow rise/fall" single oscillation and higher values/notes will trigger a "faster rise/fall" single oscillation. Any new trigger will "over ride" the current rise/fall single oscillation. The higher the value, the more of the "OSC wave intensity" you will get. The higher the value, the more of the "AD wave intensity" you will get. This will set a "base illumination" (white) upon which the pulsating (oscillating) colour will sit. This will set a "base illumination" (colour) upon which the pulsating (oscillating) colour will sit.